A team of four experts is preparing to tour the UK to explore how the "gig" economy is affecting workers' rights. 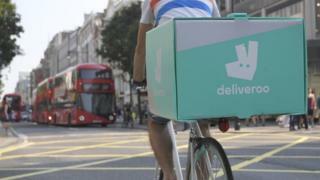 Mathew Taylor, chief executive of the Royal Society for the Arts, was appointed last month to lead the review into the impact of "disruptive" businesses such as Uber and Deliveroo. New technology combined with new business models has led to a rise in workers doing short-term, casual work. Many are not eligible for the minimum wage, sickness or maternity pay. The review will address questions of job-security, pension, holiday and parental leave rights. It will also look at "employer freedoms and obligations". Mr Taylor will be joined by the entrepreneur, Greg Marsh, who founded onefinestay, a company which helps upmarket home-owners let their properties to visitors, Paul Broadbent chief executive of the Gangmasters Licensing Authority and employment lawyer, Diane Nicol. The team will be talking to businesses and workers across the UK, including in Maidstone, Coventry and Glasgow. It will look into practices in manufacturing and rural economies as well as the "gig" economy. "The most important part of our process is getting out and about to talk to businesses and workers across Britain about their experiences of modern work," said Mr Taylor, who was formerly the head of the Number 10 policy unit under Labour leader, Tony Blair. His current role at the RSA think-tank is politically neutral. "As well as making specific recommendations I hope the Review will promote a national conversation and explore how we can all contribute to work that provides opportunity, fairness and dignity," he said in a statement. Typically workers in the "gig" economy use mobile phone apps to identify customers requiring delivery services or small practical jobs. The Department for Business says 15% of those working in the UK's labour market are now self-employed. The Department for Business, Energy and Industrial Strategy is also set to launch a research project into the scale of the gig economy, which will examine the motivations of those engaging in "gig" work. "Helping us to understand what impact modern employment practices have on workers will inform our forthcoming industrial strategy and also help us ensure our labour market and wider economy works for everyone," said Business Minister Margot James. The government's Autumn Statement earlier this month indicated how the "gig economy" is also beginning to affect budget revenues, as self-employment and casual work reduce the amount of tax being paid. The Office for Budget Responsibility (OBR) estimated that in 2020/21 it will cost the Treasury £3.5bn. Chancellor of the Exchequer Philip Hammond indicated he would be looking for more effective ways to tax workers in the shifting labour environment.